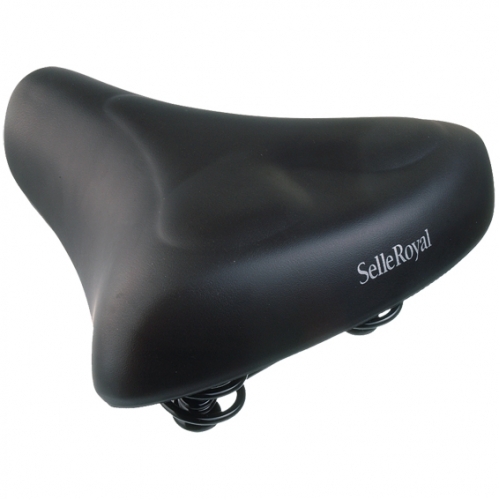 Home > Parts for maintenance of older and traditional bikes > SelleRoyal Classic 8261 saddle "Relaxed"
A wide, sprung, saddle designed for comfortable upright riding. This is the type of saddle fitted on the majority of everyday bicycles in the Netherlands because it's practical and comfortable. This is not a fancy looking but incovenient to use boutique bicycle saddle made of leather. Rather, it's a fit and forget saddle for bicycles which are actually used on a daily basis. Due to not being made of leather it can be used in all weather without the risk of it going hard or rotting, and no polishing or treatment against damp is required. That's why saddles like this are fitted to almost all Dutch utility bicycles. We have this saddle on most of our upright bikes (see "additional images"). If you ride in an upright position then this saddle is comfortable for most people most of the time and works very well for many years of daily use. Also available with gel insert for added softness, but I prefer the saddle without the gel insert. Photos in "additional images" illustrate the difference between the standard and gel insert version of the saddle. 243 mm long x 224 mm wide, unisex. The saddle is delivered with a bracket to fit traditional style saddle pins, but this can be removed if you have the sort of pin which clamps directly onto the rails of the saddle. Judy prefers the other saddle that we sell, which is a different shape made especially to suit women.